Constant Verick described himself as “élève spécial” (“special student”) of Parisian microscope-maker Edmund Hartnack (1826-1891). Since Hartnack was only 3 years older than Verick, it is very unlikely that Verick could have been Hartnack’s apprentice (although he may have apprenticed with Hartnack’s business predecessor, Georg Oberhauser (1798-1868). Yet, Verick evidently worked for Hartnack before leaving to run his own business in 1866. That move suggests that Verick was a senior employee of Hartnack, already familiar with microscope manufacture and retail. A number of modern publications have mistakenly stated that Verick took over Hartnack’s Paris optical business after Hartnack left at the outset of the 1870-71 Franco-Prussian War. Actually, Hartnack had a partnership with Adam Prażmowski (1821-1885), who managed the Paris business as “Hartnack and Prażmowski”. Prażmowski acquired sole ownership in 1879, then passed it on to Bézu and Hausser around 1883. Verick was not part of any of those businesses. Verick and Hartnack had another, rather complex relationship. Hartnack married Johanna Maria Louise Kleinod on April 24, 1855, in Anspach, Bavaria (Germany). Johanna’s mother was the sister of Georg Oberhauser, so Hartnack became Oberhauser’s nephew-in-law. Johanna had a younger brother, Jean-Christophe Kleinod (originally, his name was probably Johann Kristofer). Kleinod appears to have worked for some time for his uncle Oberhauser and brother-in-law Hartnack. Oberhauser retired in 1860, leaving Hartnack as sole owner. In 1863-64, Kleinod left Hartnack to take over the optical and mathematical instrument business of R. Daeppen at 2 Rue Parcheminerie. Kleinrod died soon after, in 1866. Verick then left Hartnack to take over Kleinod’s business (records show him to be proprietor of 2 Rue Parcheminerie by 1867). On June 24, 1869, Verick married Kleinod’s widow, Anne-Marie Moser. Thus, Verick was the second husband of the widow of the brother of the wife of Edmund Hartnack. Verick’s earliest products carried descriptions of him as successor to Kleinod (Figures 1-2). Those date between 1866 and, probably, Hartnack’s 1870 departure from Paris. It seems unlikely that Verick would have competed with Hartnack while also using his name - as “élève spécial d’E. Hartnack” - while Hartnack was still in Paris. Since Hartnack retained an active business in Paris after his departure, with Prażmowski, it is possible that Verick sought to connect himself in the minds of customers with the old and respected optical manufacturer. 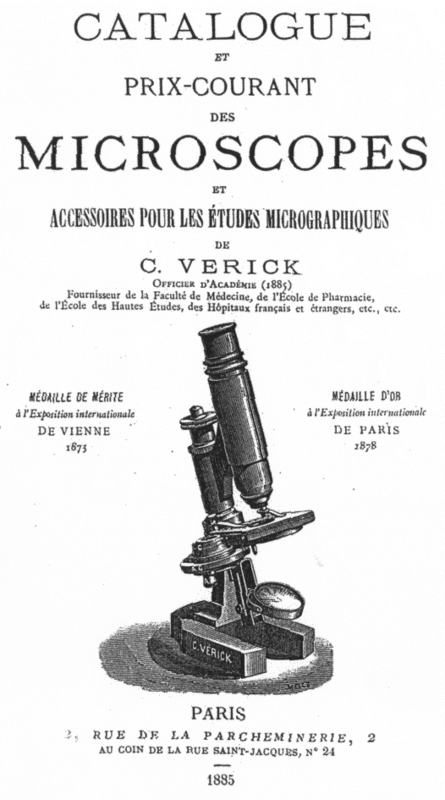 Henri van Heurck’s 1869 edition of Le Microscope stated, “M. Verick construit six espèces de microscopes composés” (Mr. Verick produces six models of compound microscopes). He also wrote “Les instruments de ce constructeur, qui est un élève et un ami intime de M. Hartnack, méritant les plus grands éloges” (The instruments of this builder, who is a student and a close friend of Mr. Hartnack, deserve high praise). 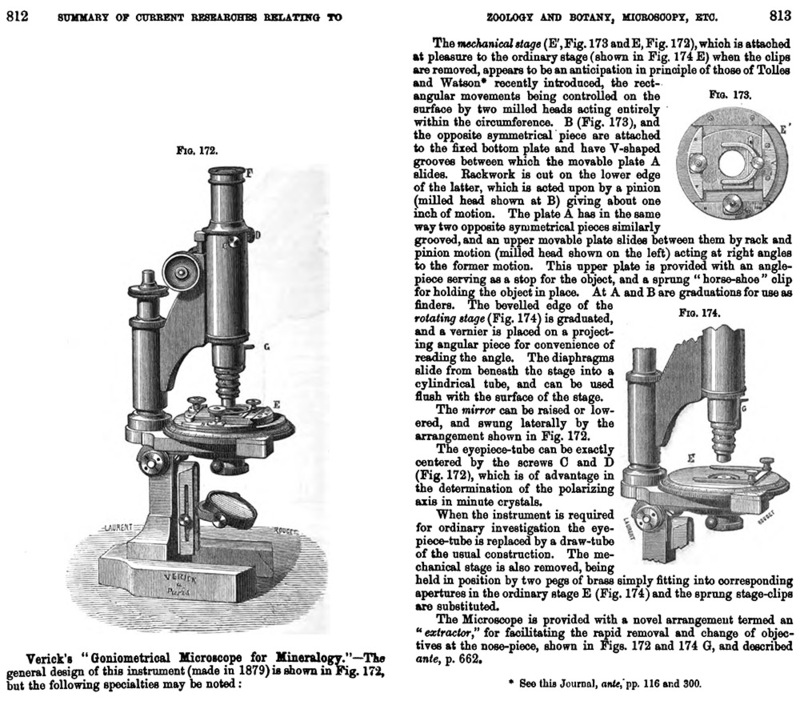 An 1870 article by Ray Lankester in Nature on how to chose a microscope considered Verick’s and Hartnack’s instruments to be equal to each other, and spoke highly of both firm’s optics. During the 1880s, Verick formed a close business relationship with Maurice Stiassnie (1851-1930), an employee who would eventually acquire the Verick business. There was also a family relationship between Verick and Stiassnie: Verick’s wife, Anne-Marie Moser Kleinod Verick, had a niece named Rosine Jungreitmayer who lived with the Vericks and, in 1886, married Maurice Stiassnie. Thus Stiassnie became Verick’s nephew-in-law (not son-in-law, as is often written). By 1882, Stiassnie was operating his own optical shop, at 43 Rue des Écoles. Verick turned over his business at Rue Parcheminerie to Stiassnie during the early 1880s. An article in the 1884 Archives de Physiologie Normale et Pathologique referred to “Stiassnie, successeur de M. Vérick”. Bizzozero and Firket’s 1885 Manuel de Microscopie Clinique also referred to “M. Stiassnie, qui a succédé à M. Verick”. Nonetheless, the firm’s 1885 catalogue named Verick as the owner, and did not mention Stiassnie. Probably, the business put forth the owner as Verick, due to his long-standing reputation, while microscope experts were aware that the relatively-unknown Stiassnie was the actual owner. Jules Pelletan indicated that Verick initially turned over management of the business, then resumed authority in partnership with Stiassnie by 1889 - his words on the 1889 International Exposition in Paris, “J'arrive à l'exposition de M. Vérick. Ce constructeur avait, comme on le sait sans doute, cédé, il y aquelques années, sa maison à un successeur, mais il l'a reprise récemment, - à mon avis, il a bien fait, - et s'est adjoint un associé. C'est donc sous la raison sociale C. Vérick et Stiassnié qu'il expose cette année.” (I come now to Mr. Vérick's exhibition. This maker had, as we know, probably ceded his business to a sucessor a few years ago, but he took it over recently - in my opinion, he did well - and added a partner. It is therefore under the name C. Vérick and Stiassnié that he exhibits this year. ), in the Journal de Micrographie. The Verick-Stiassnie business operated both Verick’s shop at 2 Rue Parcheminerie and Stiassnie’s shop at 43 Rue des Ecoles. Constant Verick’s 1891 Paris voter registration gave Rue des Ecoles as his address. He died there the following year, on October 30. Stiassnie produced microscopes and other optical instruments until his death, often with mention of Verick’s name. His sons and others continued the Stiassnie operation until well into the twentieth century. Figure 1. A compound microscope by Constant Verick, signed on the base as successor to Kleinod. The inscription dates this instrument’s manufacture to between 1866 and ca. 1870. As might be anticipated, the lenses are interchangeable with those of Hartnack and Prażmowski, implying that Verick took his thread-cutting machines with him when he left. It bears serial number 196, stamped between the columns. This style was later described as the “Microscope de Laboratoire” (Figures 12 and 18). This model was still produced by his successor, Maurice Stiassnie, through the end of the nineteenth century. Figure 3. A camera lucida that was produced by Verick’s predecessor, Jean-Christophe Kleinod. He was in business for only about 2 years (1864 until 1866), so his instruments are quite rare. Figure 4. 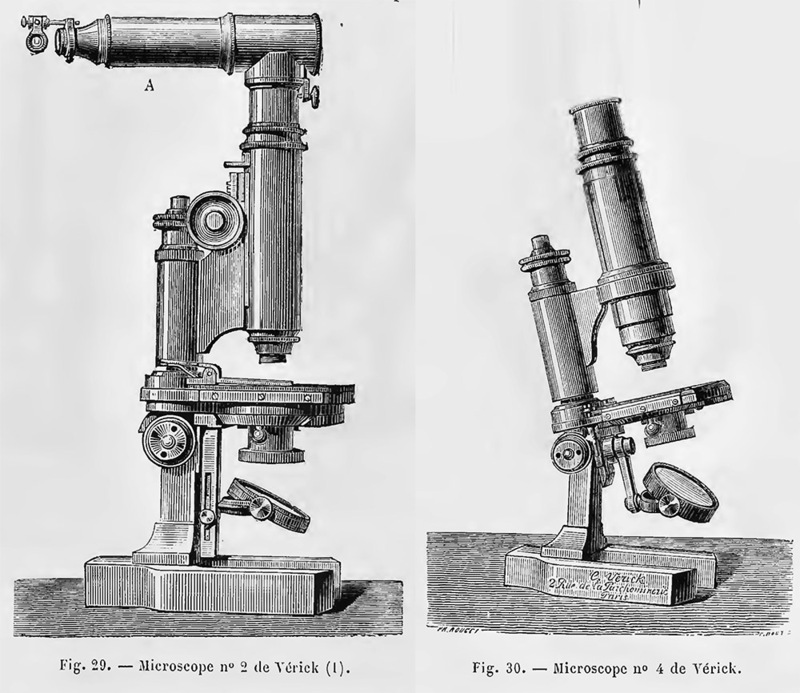 Verick’s 1876 Number 2 and 4 microscopes, as described in Jules Pelletan’s “Le Microscope: Son Emploi et ses Applications”. Figure 5. 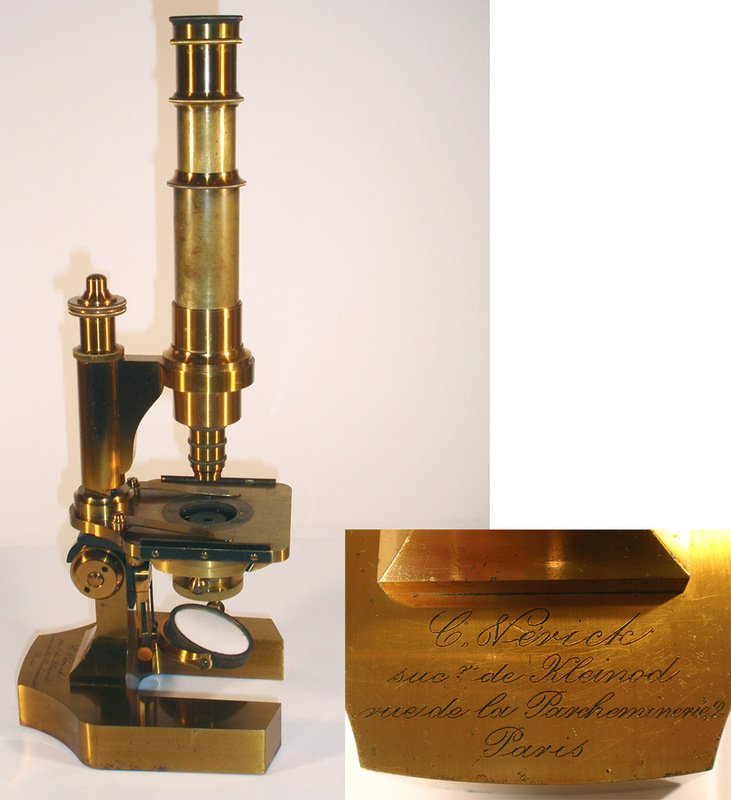 Verick microscope with serial number 778, a handwritten date of 1872, and engraved “élève spécial de E. Hartnack”. 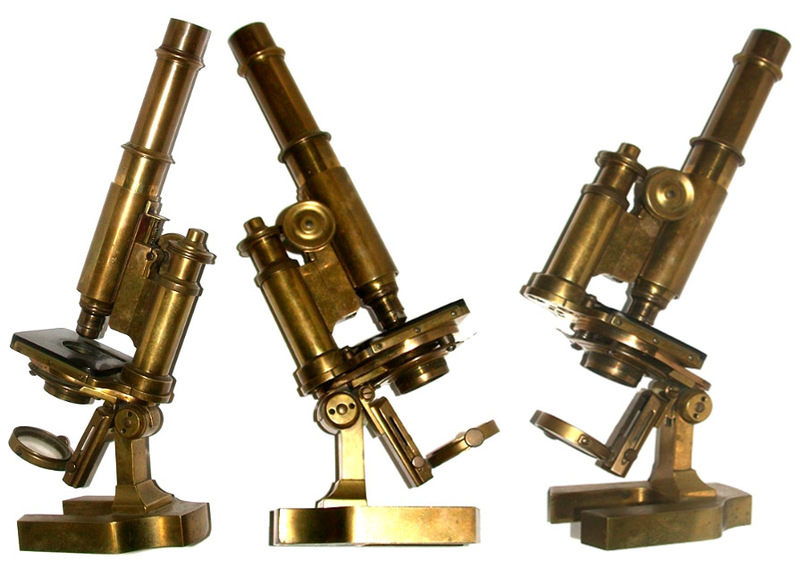 This appears to be the model described as Number 4 (Figure 4, above), and by other numbers and description “Microscope à Platine Fixe”. Adapted for nonprofit, educational purposes from an internet auction site. Figure 6. 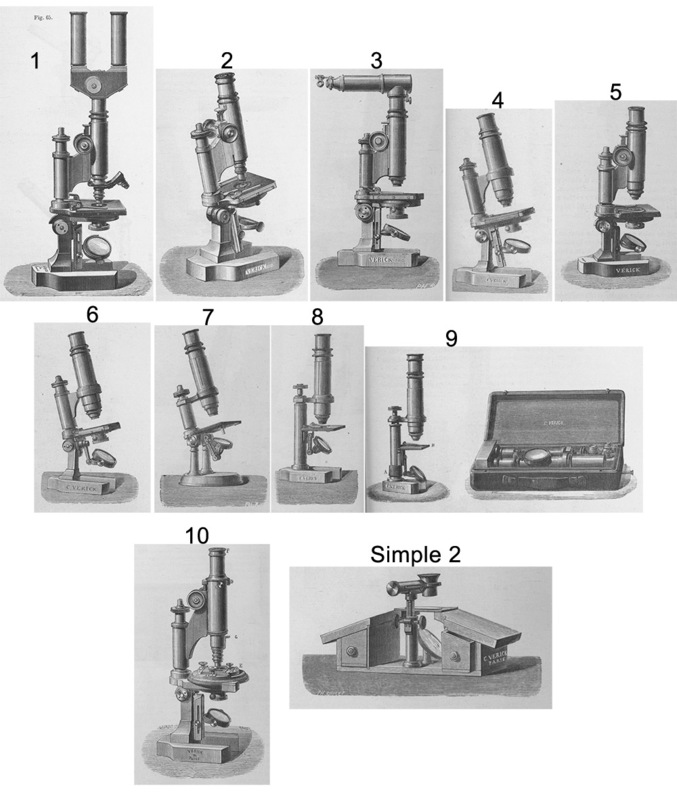 A Verick microscope that is similar to that shown in Figure 5, but with a few variations. Noting the simple substage, it was likely produced during the 1870s or early 1880s. 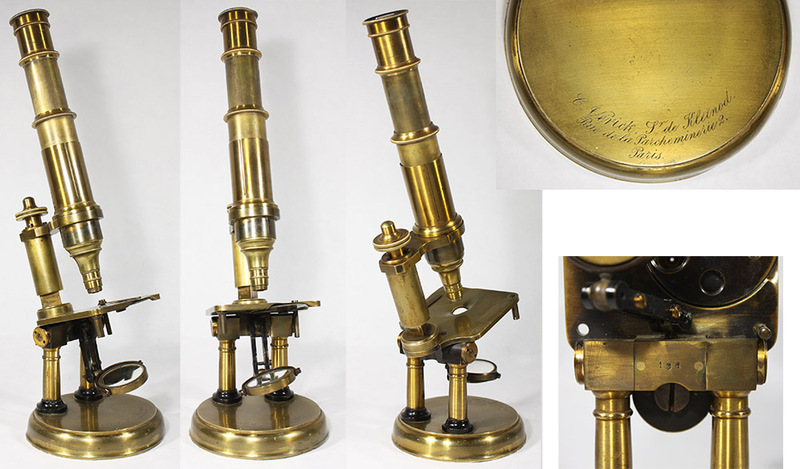 Adapted, with permission, from http://www.microscope-antiques.com/verick.html. Figure 7. 1881 note on Verick’s dissecting microscope, from “The Journal of the Royal Microscopical Society”. Figure 8. 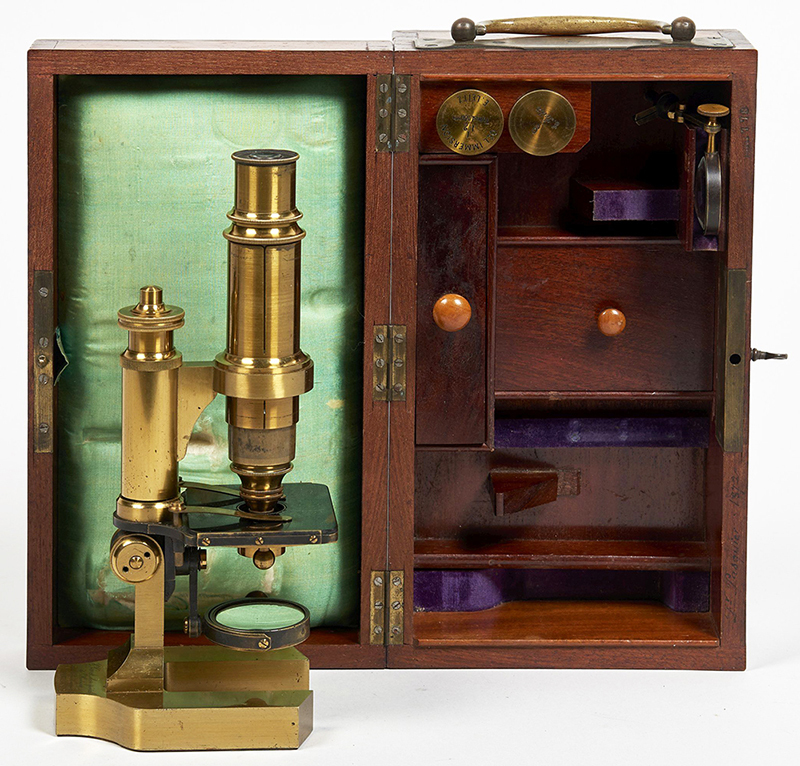 An unsigned Verick-type simple dissecting microscope - note the deep lens mount that was noted by “The Journal of the Royal Microscopical Society” in 1881 (see Figure 7). 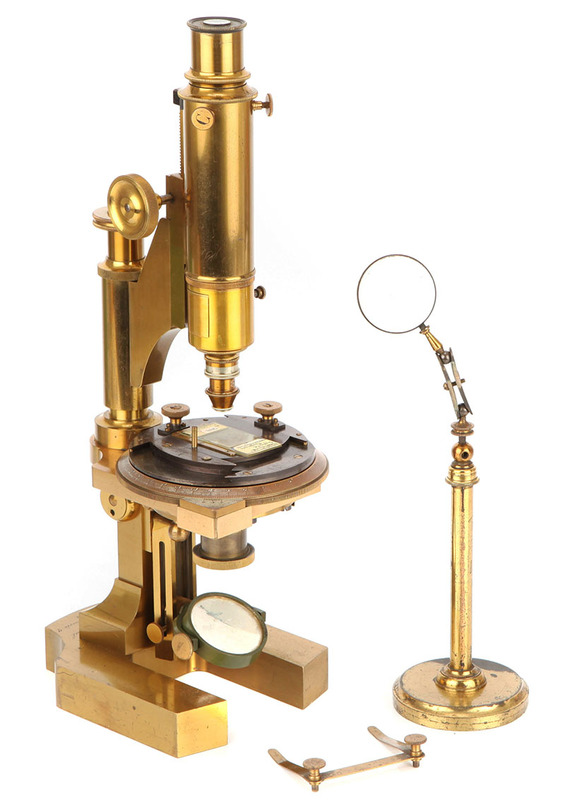 Adapted, with permission, from http://www.antique-microscopes.com/photos/Verick_Dissecting_Microscope.htm. Figure 9. 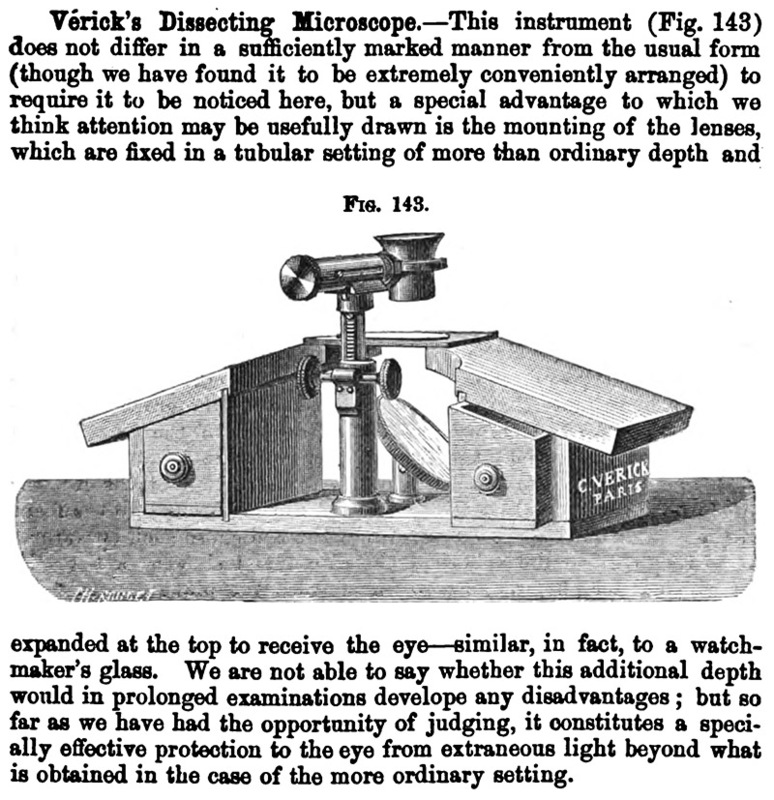 1881 note on Verick’s new “Goniometric” microscope, from “The Journal of the Royal Microscopical Society”. Figure 10. A Verick “Microscope Goniométrique”, matching the 1881 engraving shown in Figure 9. Adapted for nonprofit, educational purposes from an internet auction site. Figure 11. 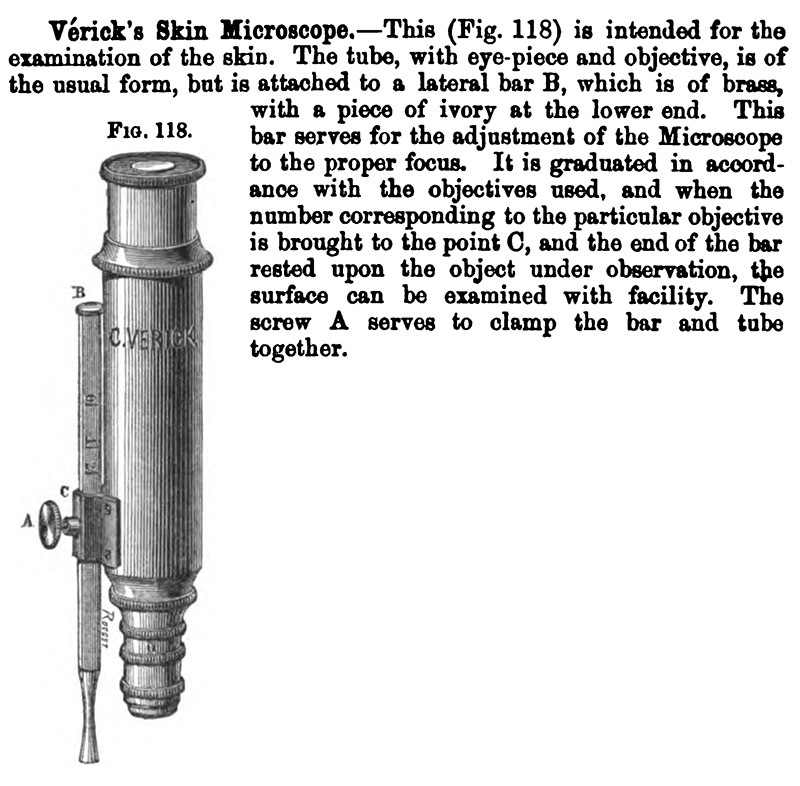 Verick’s unique “skin microscope”, from “The Journal of the Royal Microscopical Society”, 1881. Figure 12. 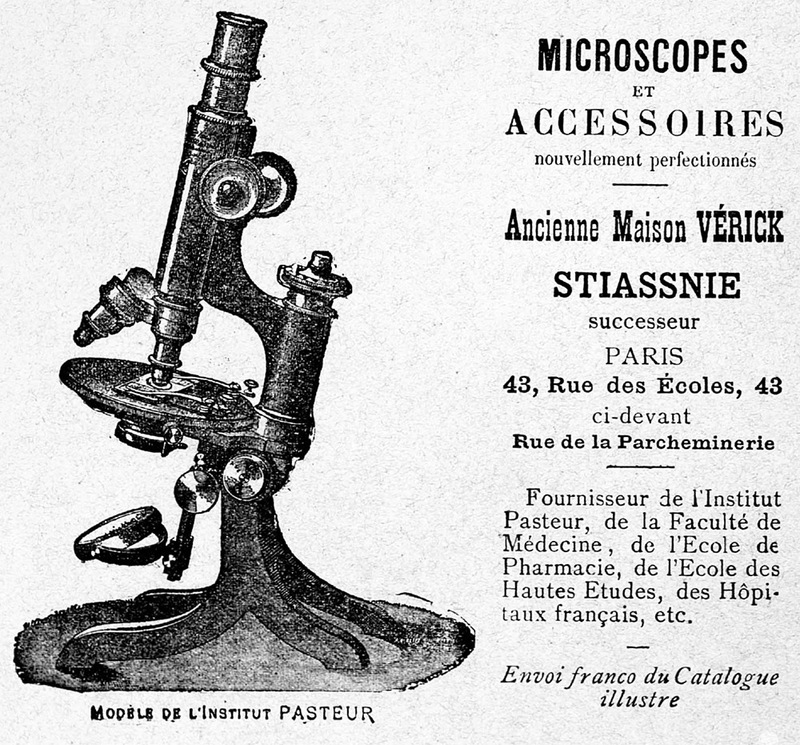 Eugène Trutat’s 1883 “Traité Élémentaire du Microscope” included images and descriptions of 11 microscopes that were produced by Verick - presumably taken from a recent catalogue. No. 1, Microscope complet, Grand Modèle binoculaire; No. 2, Microscope Grand Modèle, de construction plus simple; No. 3, Microscope Moyen Modèle; No. 4, Microscope Petit Modèle; No. 5, Microscope à Crémeillére, Petit Modèle; No. 6, Microscope à Platine Fixe; No. 7, Microscope de Laboratoire; No. 8, Microscope d’Étudiant; No. 9, Microscope de Voyage; No. 10, Microscope Goniométrique pour les Reserches Minéralogiques; No. 2, Microscope Simple. Figure 13. 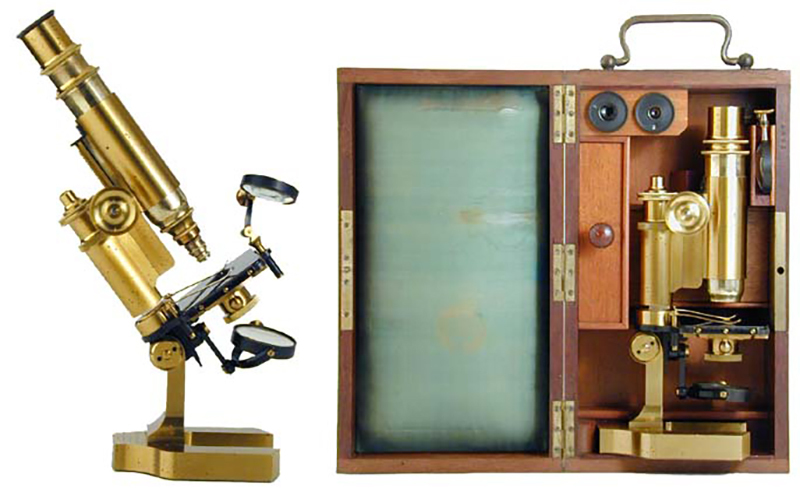 Two examples of Verick’s “Microscope de Laboratoire”. The microscope in the left and center images has serial number 3275, and that on the right has serial number 4680 (as with the similar microscope shown in Figure 1, the serial numbers are stamped between the pillars). Number 4680 is threaded to accept RMS-standard objective lenses. 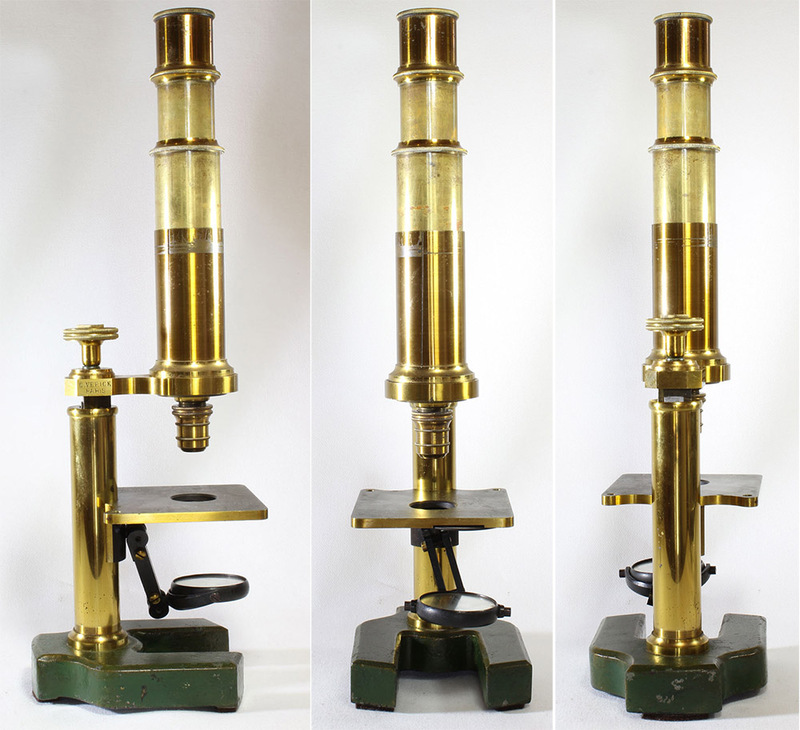 Images of microscope 3275 adapted, with permission, from http://www.antique-microscopes.com/photos/verick__dp.htm. Figure 14. 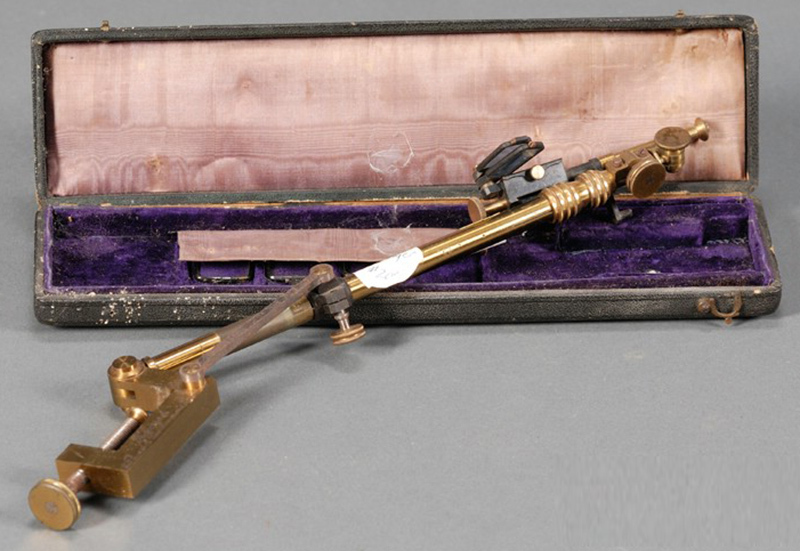 A Verick “Student” microscope, listed as Model Number 8 in 1883, and Model Number 7 in 1885. 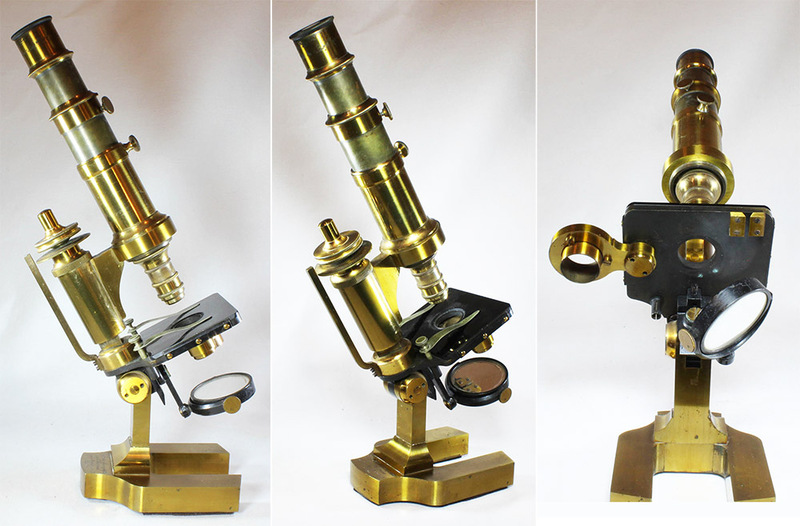 Adapted, with permission, from https://www.microscope-antiques.com/verick7.html. Figure 15. A Verick “Microscope de Voyage” (traveling microscope). To pack, the V-shaped foot folds together, the stage pivots 90 degrees, and the body fits upside down into its tube. “The Journal of the Royal Microscopical Society” noted its introduction in 1883. The non-RMS objective lenses suggest early production for this example. 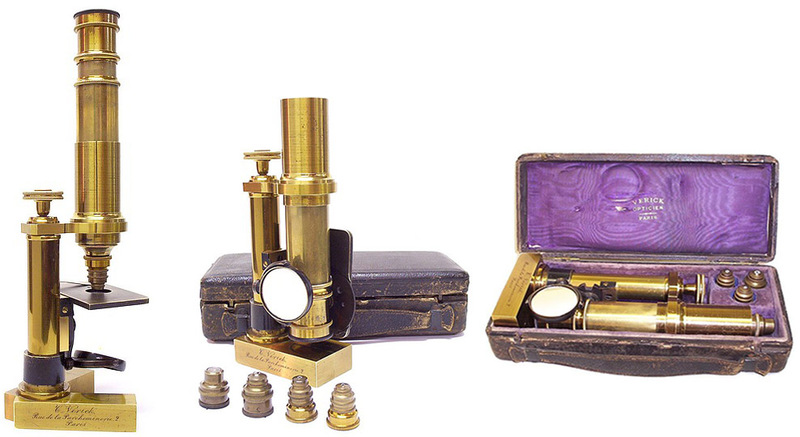 Adapted, with permission, from http://www.antique-microscopes.com/photos/Verick_Malassez_Travelling_microscope.htm. Figure 16. Verick microscope with rack-and-pinion coarse focus, and a substage that suggests production prior to 1885. Adapted for nonprofit, educational purposes from http://www.arsmachina.com/verick1166.htm. Figure 17. A large Verick microscope of unknown model and vintage. Note that the upper body can rotate around the stage. Adapted for nonprofit, educational purposes from an internet sale site. Figure 18. 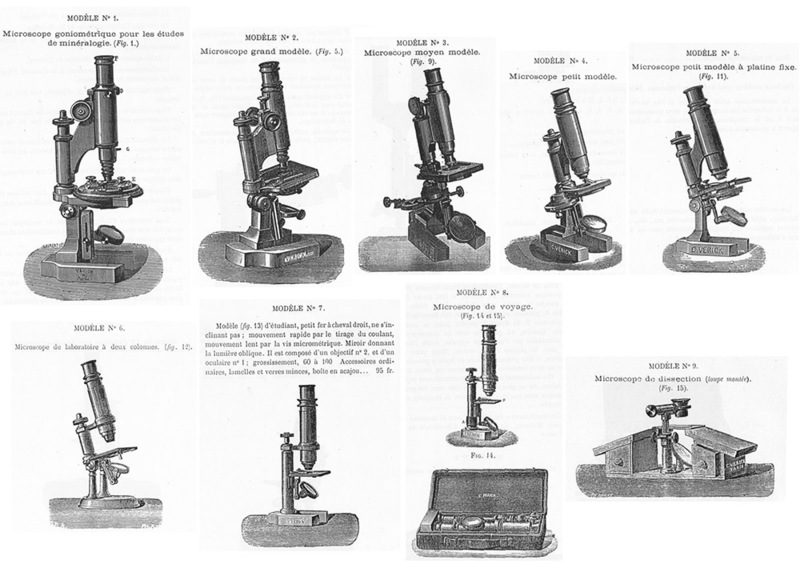 Images of microscopes from Verick’s 1885 catalogue. The instruments are very similar to those shown by Trutat in 1883 (see Figure 12, above). There are notable changes: Models 3, 4, and 5 are shown with Abbe substage condensers, and the arms connecting the bodies and limbs of Models 4 and 5 have different shapes. Note also that most of the model numbers do not match their ca. 1883 counterparts (see Figure 12). Figure 19. Cover for Constant Verick’s 1885 catalogue. He notes a Medal of Merit from the 1873 Vienna International Exposition, and a Gold Medal from the 1878 Paris International Exposition. Despite the business name, it had already been taken over by Maurice Stiassnie. Figure 20. 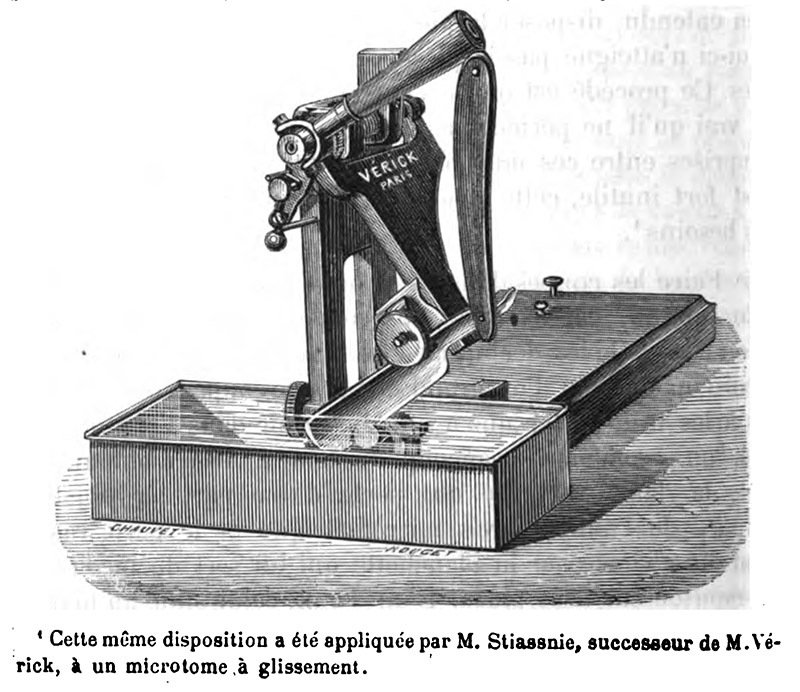 In 1884, Louis Malassez described the manufacturer of this microtome as “M. Stiassnie, successeur de M. Verick”. Thus, the transfer of ownership predated 1884, even though the business continued to be known as simply “Verick” for several more years. Figure 21. An 1887 advertisement for “C. Verick”. From “Journal de Botanique”. Figure 22. An 1897 advertisement from Maurice Stiassnie, successor to the “Ancienne Maison Verick”. From “Le Micrographe Préparateur”. 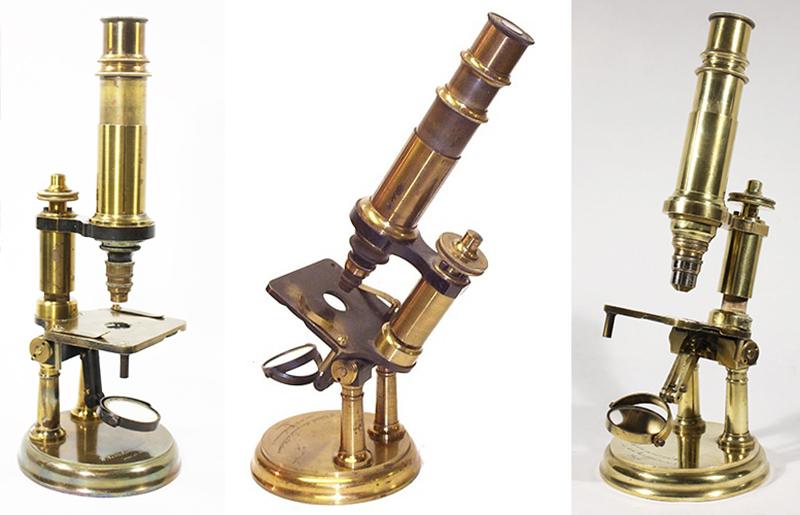 Thank you to Allan Wissner and Barry Sobel for permission to share their microscope images, and to Steve Gill for making Verick’s 1885 catalogue and other valuable resources freely available through http://www.microscopy-uk.org.uk/Little-Imp/index.html.